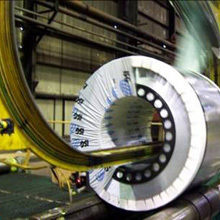 For automatic coil wrapping, we offer Cobra coated woven metal wrap utilizing Duramet technology. Cobra provides a far superior and cost efficient packaging solution as compared to VCI stretch film alone. Offered in a variety of widths and roll lengths and can be custom printed which is not feasible with VCI stretch film.